Republicans in Congress tout increased military spending in the omnibus budget bill signed by President Donald Trump, but spending on defense actually increased less than four other areas in percentage terms. An analysis by CQ shows that four other areas are getting larger increases in spending than the Department of Defense. The omnibus bill raised combined spending on Transportation and Housing and Urban Development to $70.3 billion, a 20.1 percent increase from the fiscal year 2017 budget allocating $58.5 billion. Transportation/HUD saw the largest increase in spending, almost 6 percentage points more than the next-highest increase, because of Trump’s infrastructure spending plans. About $10 billion of the increased spending will serve as a down payment for the infrastructure program. 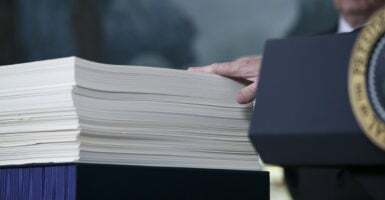 The Trump administration asked for $200 billion in federal funding, intended to leverage $1.5 trillion in private and local funding over the next decade for roads, bridges, water systems, airports, and other infrastructure. The energy/water component saw the second-highest increase of spending in percentage terms, at 14.4 percent, rising to $43.2 billion in discretionary funding this fiscal year. Included is $1.8 billion for the Department of Energy’s nuclear weapons program. The energy-water component also includes funds for the U.S. Army Corps of Engineers. The $48.2 billion in spending on the Department of Homeland Security funds the Coast Guard, Customs and Border Protection, the Federal Emergency Management Agency, and assorted other agencies. The 12.8 percent increase includes $1.6 billion for enhanced fencing and security improvements on the southern border. The $92.7 billion budget for military construction and the Department of Veterans Affairs is a 12 percent jump. It includes a new VA program to expand mental health care access for veterans with other-than-honorable discharges, in an effort to reduce suicide among vets. The increase in defense spending of 10.1 percent is still 6.5 percentage points behind the average overall spending increase of 16.6 percent since 2014. 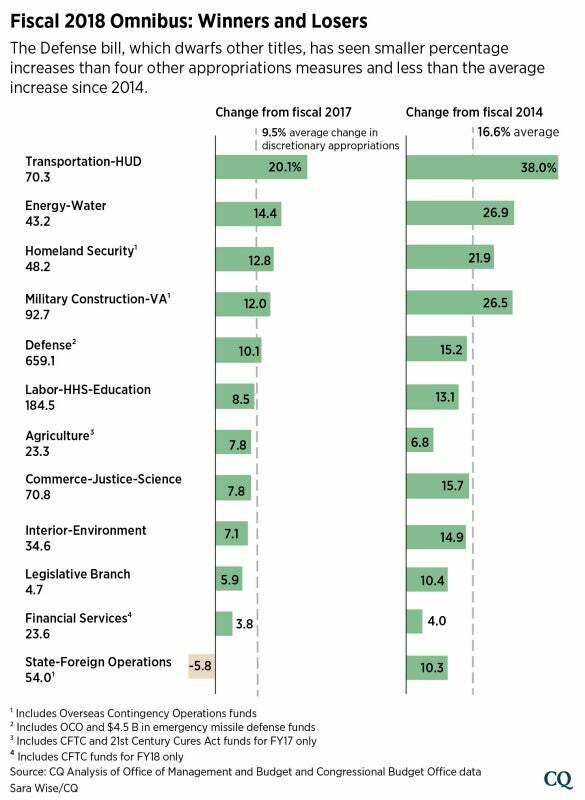 The defense spending increase came in 10 percentage points behind that of the top spending increase category, Transportation/HUD. With a budget of $659.1 billion, however, defense spending is at its highest level since 2012, adjusted for inflation.